Following China’s futuristic “ocean of knowledge,” a library in a South Korean mall has garnered considerable attention online for its beautiful interiors. 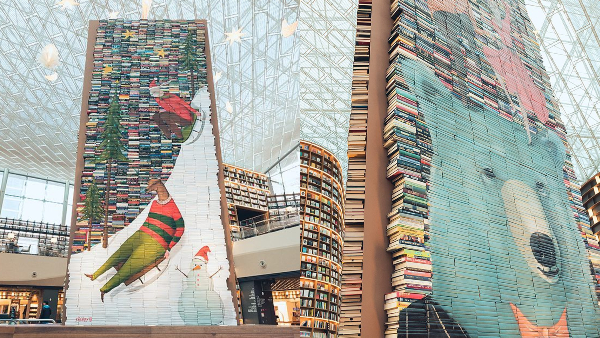 Freshly established in 2017, the spacious Starfield Library in Gangnam, Seoul’s Starfield COEX Mall might have already stunned many with its immersive 50,000-book collection and 43-foot-tall shelves, but it’s its new Christmas displays that are making it hard for people to stay hushed. This week, the library unveiled its collaborative installations with American artist Mike Stillkey, renowned for his fantastical book sculptures, that literally appear to leap right out of a fairytale. The displays, which take up three walls, feature a bunny and reindeer riding their sleds down snowy peaks with lit-up fir trees in the distance, two cats dancing atop a blue-furred bear, and cycling animals. This is the sort of world that avid readers talk about getting drawn into.